There's no denying the affection that theatergoers have for animals onstage, whether written into the scripts, as in Of Mice and Men or The Lieutenant of Inishmore, or rendered literal by directorial fiat, like the live snakes in the Joffrey Ballet's recent production of La Bayadere. 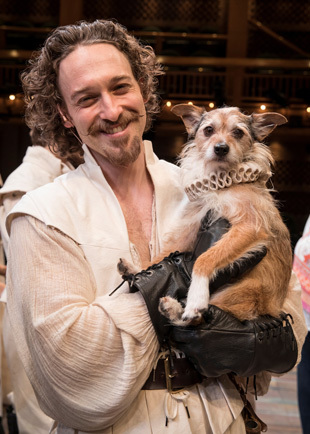 So it was no surprise to see opening night audiences at Shakespeare in Love smile upon hearing that Will Shakespeare's biggest fan—Queen Elizabeth I, herself—was "exceeding fond" of plays featuring dogs. When Her Royal Highness says she wants bow-wows, can a pack of hounds be far away? It's not the first time man's-best-friends have trod the boards at Chicago Shakespeare Theater. The cast of The Merry Wives of Windsor in 2014 included a great dane, a beagle and a poodle-retriever mix, their performing tasks confined to strutting beside their owners and, in one case, lying prone for a gentle serenade. 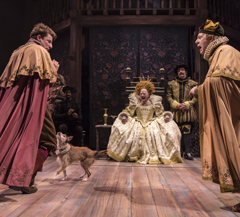 By contrast, the Fido in this rollicking comedy of Elizabethan playmaking must perform such exhibition stunts as full rollovers and attacks on cowardly villains—all off-leash, with no visible commands from its two-legged scene partners. The lucky pooch playing the role of Spot, mascot to the Lord Chamberlain's Men, is a bantamweight terrier named Dash, adopted from Happy Tails Rescue and companion since 2016 of actor Luigi Sottile, who plays Ned Alleyn in the show. "Before we—the human actors, I mean—started rehearsal," Sottile reports, "Dash only knew how to do half a rollover, because he loves belly rubs and that's his way of asking for one. Rendy Schuchat, founder of Anything Is Pawsable and a certified dog trainer, taught him how to extend the rollover after receiving a combination verbal and physical signal. When Richard Burbage [played by Timothy D. Stickney] says "he's never played the palace," he does a little flourish of the wrist and that's Dash's cue to do his trick." Sottile chuckles, "Sometimes Dash does it too early, because he knows a treat is coming afterward. When that happens, we have him do it twice!" The take-down of the blustering, but easily subdued, Earl of Wessex [played by Dennis Grimes] involves strategic choreography, like any action involving violent body contact. Instead of a pre-show fight call, however, Grimes meets with his four-legged nemesis backstage to offer Dash a portion of the cheese that constitutes the latter's favorite snack, securing the remainder on Wessex's ornate upper-body vestments. Then, when the moment comes for the ambush, his assailant knows exactly where to pounce. While Dash has no problem sharing quarters with his fellow thespians, his offstage time is mostly spent in his own dressing room. "If he gets friendly with too many people," says Sottile, "then when he gets onstage and sees everybody there, he won't remember which is his target." Between shows on matinee days, however, Dash enjoys walks along the pier, where he receives his full share of attention from fans who greet him with waves, pats, hugs—oh, and as with all actors, requests for selfies. Shakespeare In Love runs at Chicago Shakespeare Theater through June 18.